Gene Garrison spent a terrifying nineteenth birthday crammed into a muddy foxhole near the German border in the Saar. He listened helplessly to cries of wounded comrades as exploding artillery shells sent deadly shrapnel raining down on them. The date was December 16, 1944, he was a member of a .30-caliber machine-gun crew with the 87th Infantry Division and this was his first day in combat. Less than a year earlier, he had taken the first steps in charting his future, entering college as a fresh-faced kid from the farmlands of Ohio. Now, as the night closed around Garrison, slices of light pierced the darkness with frightening brilliance. Battle-hardened German SS troopers using flashlights infiltrated the line of the young, untested American soldiers. Someone screamed "Counterattack!" In the maelstrom of gun fire that followed the teenaged Garrison struggled to comprehend the horrors of the present, his entire future reduced to a prayer that he would be alive at daybreak. From those first frightening, confusing days in combat until the end of the war five months later, Gene Garrison saw many of his buddies killed or wounded, each loss reducing his own odds of survival. Convinced before one attack that his luck had deserted him, he wrote a final letter to his family, telling them goodbye. Garrison gave the letter to a buddy with instructions to mail it if he died. From the bitter fighting west of Bastogne in the Battle of the Bulge to the end of the war on the Czechoslovakian border, Garrison describes the degradation of war with pathos and humor. 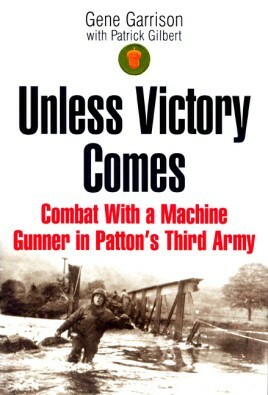 Gene Garrison's story is told through the eyes of the common soldier, a man who might not know the name of the town or the location of the next hill that he and his comrades must grimly wrestle from the enemy but who is willing to die in order to carry the war forward to the hated enemy. He writes of the simple pleasure derived from finding a water-filled puddle deep enough to fill his canteen; a momentary respite in a half-destroyed barn that shields him from the bitter cold and penetrating wind of an Ardennes winter; the solace of friendship with a core of veterans whose lives hang upon his actions and whose actions might help him survive the bitter, impersonal death they all face. The rich dialogue and a hard-hitting narrative style bring the reader to battlefield manhood alongside Garrison, to each moment of terror and triumph faced by a young soldier far from home in the company of strangers.